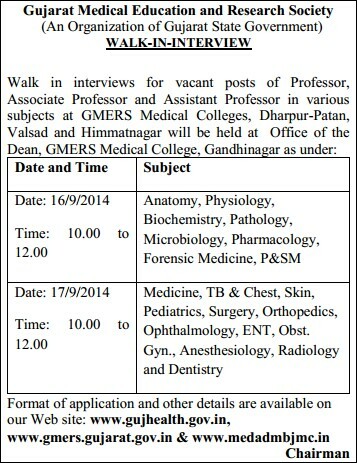 Gujarat Medical Education and Research Society (An Organization of Gujarat State Government) invited candidate for Walk in interviews for vacant posts of Professor, Associate Professor and Assistant Professor in various subjects at GMERS Medical Colleges, Dharpur-Patan, Valsad and Himmatnagar will be held at Office of the Dean, GMERS Medical College, Gandhinagar. GMERS Teaching Post Recruitment 2014 and Format of application and other details are available on official Web site www.gujhealth.gov.in, www.gmers.gujarat.gov.in & www.medadmbjmc.in. Walk in Interview will be held on 16 th and 17 th September, 2014 for Medical Professional candidates in General/Reserved category for regular appointment on the above vacant posts. View more details about this recruitment i.g., post name, qualification, age limit, Selection Process as under. Selection Process: Selection will be made on the basis of walk in interview. Venue: Gujarat Medical Education and Research Society, F-3, 2 nd Floor, Civil Hospital, Opp. Pathikashram, Gandhinagar.